Mazda has played its cards pretty close to its chest this year, leaving everything new firmly under cover until the press conference with the headlining act, the HAZUMI concept car, taking centre stage. Why all the secrecy for a concept car I hear you ask? 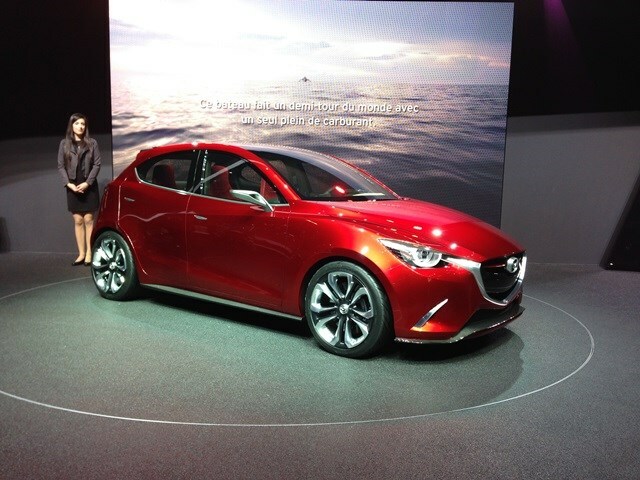 Well although named a concept, this car is a pretty close to production version of the new Mazda2 city car. Details are still thin on the ground but the Hazumi also introduces a new SKYACTIV 1.5 litre diesel engine, tuned specifically for this supermini. Euro6 compliant it also emits less than 90g/km in the concept - a figure we'd expect to be mirrored in the production Mazda 2. As well as new product and engine unveils, Mazda were also in the mood for celebrating and for good reason. It’s been 25 years since production first started on the legendary and best-selling MX-5 so there's a special display including a MK1 MX-5.